We have found about half a dozen eclipsing binary star systems in our field of view. These are systems containing two star with separations sufficiently small so that they appear as a single star to us. The orbits of these stars are oriented so that periodically one star passes in front of the other star (from our vantage point). When one star passes behind the other star its light is lost and the system appears to get dimmer. We see the star get dimmer until maximum occultation, remain at minimum light while at maximum occultation and then the light from the system grows again until both stars are once again seen fully. 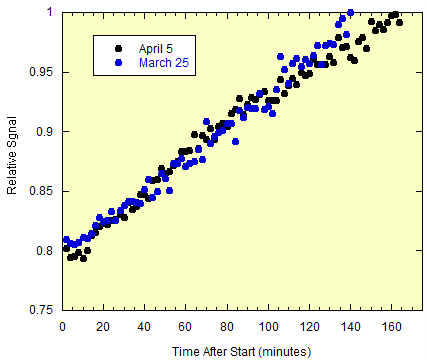 The graph below shows a great example of an eclipse in one of our systems. A different system has an eclipse duration so long that we never see a a complete eclipse process in a night. This system has a period of almost exactly 5.50 days so that we see eclipses every 11 nights. We were fortunate to have clear nights on March 25 and April 5, 2015. The eclipses on these nights for this second star system are shown below. A third system has a very short period (about six hours) and we only see a partial eclipse so that when the system reaches minimum light it immediately begins getting brighter. 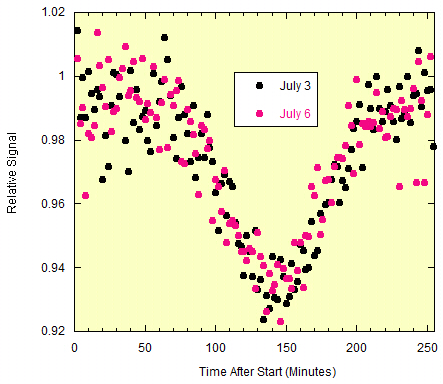 A light curve for this system from two nights in 2014 is shown below.